Today's post is all about a mascara that I'm sure you'll have heard of, that is unless you've been on another planet recently, the Benefit Roller Lash mascara. I like many other people and a lot of bloggers included, picked up my roller lash mascara when it was featured as the freebie with the February edition of Elle magazine. I was asked by a lot of my you tube subscribers and blog readers if I would pick up the roller lash and try it out and review it, so I did do and I have been using it for around 3-4 weeks now. I thought the mascara applied well and didn't go everywhere despite it being quite a 'wet' formula if that makes any sense? Sometimes when a mascara is quite wet it can go all over the bridge of my nose and fingers when I apply it but this didn't and it applied well and I found it easy to apply. The brush is curved with little spikes on it, I found it easy to get into those small lashes in the corners too and it was easy to do my bottom lashes which I sometimes struggle with. I have extremely pathetic eye lashes as you can see from the photograph below, they are really short and sparse and not the best at all. 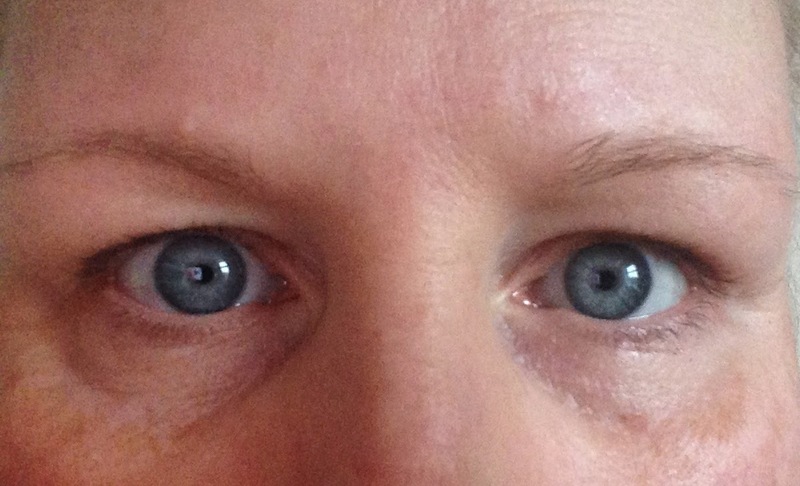 The first time I wore the mascara I was going out on a shopping trip with my mum and Lissy, I always get really hot when I'm out because I am in a lot of pain so I thought it would be a good test to try the mascara out for the first time. I also struggle with mascaras because some of them rub or smudge or as I call it blob onto my socket bone and leave a black mark, it drives me mad, but I had high hopes for the roller lash as one of the claims from Benefit was no smudging as well as it being good for separating, lifting and curling. 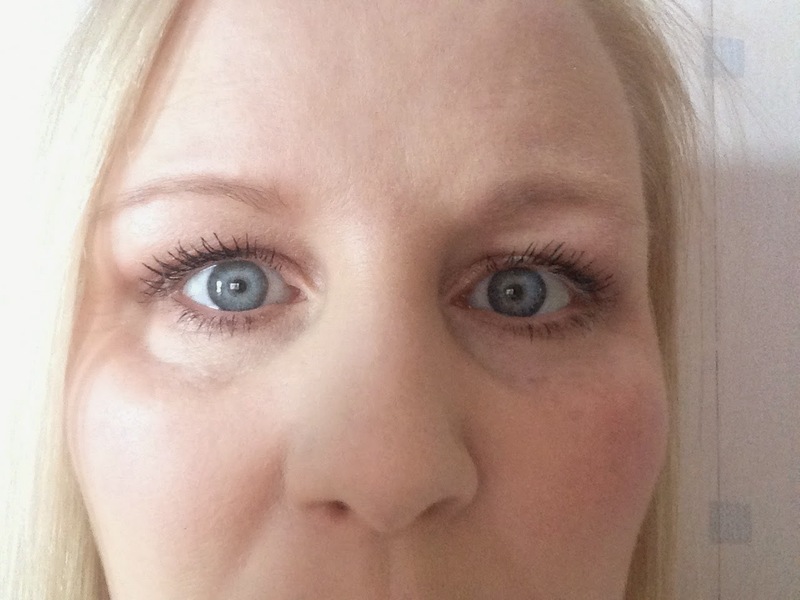 In the photographs above I am wearing 2 coats of the roller lash mascara, I have since tried using it and applying more coats to try and achieve a fuller look to my lashes but I didn't like the look and my lashes looked really spidery and clumpy, so I wouldn't recommend using more than 1 or 2 coats of the mascara. The mascara lasted well throughout the day and I didn't experience any flaking at all, I found with the Benefit They're Real mascara that I had a lot of little bits of black under my lower lash line where the mascara flaked, that said I really don't like they're real at all, but that's a whole other blog post. Unfortunately though I did experience smudging/blobbing on my socket bone, this happens every time I wear the mascara, it isn't a lot but it still smudges or blobs and you can see it, if I wear dark make up it isn't as obvious but it is still there. Overall I thought the roller lash was a good product it gave me length to my lashes and they were nicely separated, I was impressed that I didn't have any flaking but disappointed that I did experience smudging/blobbing, I do like the mascara and think my lashes look lovely and long when I wear it but I wouldn't pay £19.50 for it and even if it didn't smudge I wouldn't buy it I'm afraid, I think it's a good mascara and it does lengthen and lift my lashes and it separates them nicely too. Benefit claim the mascara lifts and separates and curls the lashes, I agree with the lifting and separating but not so much the curl, I didn't see much of a curl to my lashes but the mascara did lift and separate nicely. 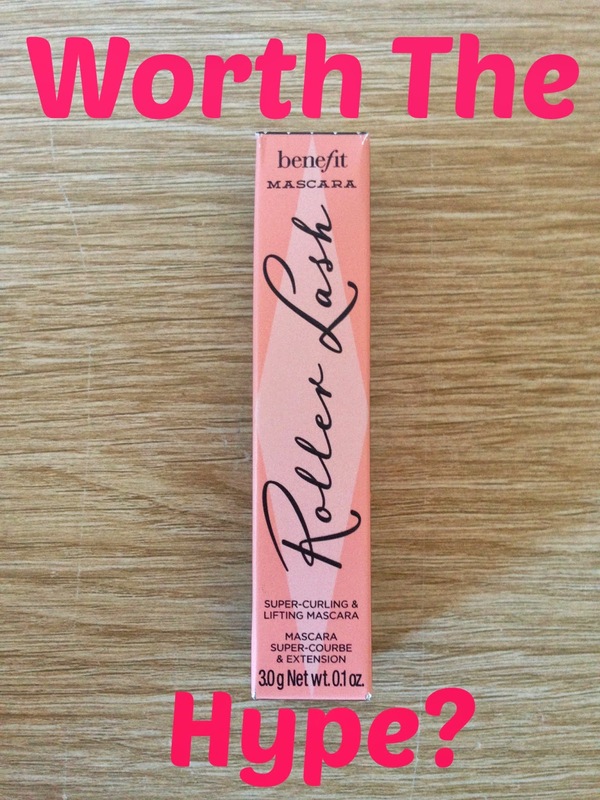 I also liked that it was easy to apply and wore well but I don't think it is worth the £19.50 price tag I'm afraid, I think you can get mascaras that are just as good or better for less money.
" It's good but a bit too 'wet' it feels like it doesn't dry and it can make your eye lashes look clumpy if you're not careful, it didn't really curl my lashes but it's a good mascara and I really like it but I don't think it's worth that much money and I wouldn't pay £19.50 for it"
So Lissy agreed with me, she likes the product but doesn't think it's worth the price tag and like me she found it can look clumpy if you apply too many coats of it. Lissy didn't experience any smudging or flaking either, she doesn't usually find mascaras smudge/blob on her though but some do flake. I would agree it's a great mascara and it does do what it says on the tin so to speak, as I said I didn't see much of a curl but I do agree with people who say it's a good product because it is, I personally don't think it's groundbreaking but it is as good as people say it is so I would say in my opinion it's worth the hype, but not worth the £19.50 price tag. If you would like to try roller lash, you can buy it on line from Boots, Debenhams, Look Fantastic and The Benefit website priced at £19.50. Have you tried roller lash? What did you think? Let me know in the comments.